The grey multi-purpose rope dog training lead is ideal for training dogs and puppies as well as for everyday walking. With the 5 variable length options, you can choose how you want to walk your dog, ranging from close and controlled, to keeping loose reigns. The new Long Paws Multi-Function Rope Training Leash has been made with the active pet in mind. The leash has been manufactured to the highest safety standards and combines quality and comfort in a new and unique package. The Long Paws Training Leash has been made from high strength woven polyester rope, and includes lightweight, locking karabiner clips. The clips attach easily and lock shut with a slide of the latch. 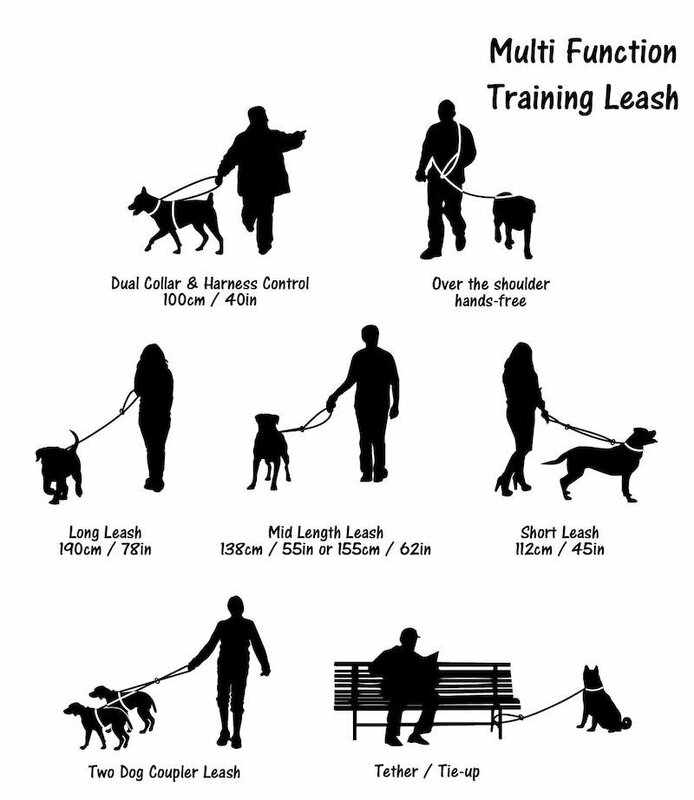 The training lead allows you to walk two dogs at a time, to tether (tie up) your dog while you're relaxing; or to use the lead hands-free - either over the shoulder or around your waist while walking. The rope training leash is extremely strong, and has a little shock-absorbing bounce in the rope. There is a small latching karabiner-styled safety clip on each end, and four welded O-rings/D-rings along the length of the rope. The two clips and various rings allow you to adjust the length of the lead, attach the clips to a harness and collar simultaneously, and walk two dogs at a time.